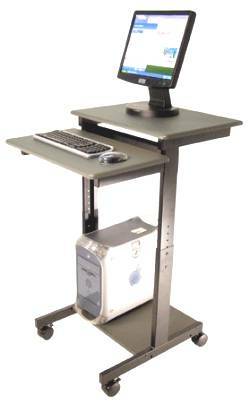 Ideal for presentations, trade show exhibits, showrooms, industry and any application where a standing operation computer desk is required. Its narrow 24" width allows it to be placed in virtually any spot or corner. In addition, the height adjusts easily, from 39 to 45". Height adjusts from 39" to 45" (floor to top shelf). Four 3" casters (two with locking brakes).